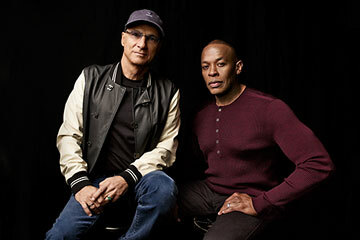 One of the nice things about being Jimmy Iovine is that when you call Dr. Dre, the world’s most famous hip-hop producer, he actually picks up the phone. That’s likely because the two have had a habit over the years of making millions on various collaborations. Iovine — who first earned a name for himself behind the mixing console, recording rock classics such as Bruce Springsteen’s Born to Run and U2’s Rattle and Hum — signed a deal with Dre’s Aftermath Entertainment in 1996, after Dre had established himself as a hitmaker with the seminal rap squad N.W.A. Since then, Dre has produced Eminem, 50 Cent, Eve and Gwen Stefani for Iovine’s company, Interscope Records. And for more than five years, the two have been partners in Beats by Dre, which has succeeded in transforming headphones from a ubiquitous into a must-have fashion accessory — one consumers are willing to pay $300 for. Now the two are embarking on the riskiest gamble in the company’s short history. They are betting that if the Beats image can sell tony headphones, it can also win customers in the record industry’s most crowded and tumultuous new sector: streaming music.